Spruce up your home network. We've spoken before about how a good router can make a surprising amount of difference to your gaming life. Particularly if your home is filled with other devices all connected to the network, making sure your online gaming gets priority is... a priority. You can end up spending many hundreds on them if you're not careful though. 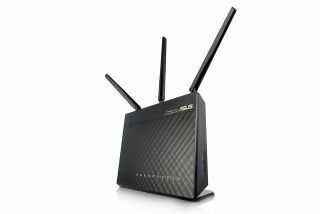 The Asus RT-AC68U is on sale right now on eBuyer for £120, and it just so happens to be a router we highly recommend. The Asus RT-AC68U and the Asus RT-AC68P, which is listed as our favorite budget router for gaming, are almost identical. The one that's on sale here has the added bonus of parental controls and antivirus scanning built in. It has a nice compact design, but doesn't sacrifice too much performance. It's a dual band AC1900 router, with solid throughput on both 2.4 GHz and 5 GHz frequencies. Inside there's a dual core processor with a 1.4 GHz clock speed, 256 MB of RAM, and 128 MB flash memory. On the back you'll find pretty standard fare: four Gigabit LAN ports, an Internet connection port, a USB 2.0 port and a USB 3.0 port. Of course, it has the all important Quality of Service technology which allows you to choose between five levels of priority, and you can also prioritize web traffic based on broad categories like gaming, video and audio streaming, web surfing, and so on. Normally this router sits up around £150, so you're saving around £30. It has competition in the budget space from other routers such as the TP-Link Archer C9, but the fact the Asus router came out on top in three out of the four tests we put them through puts it in pole position. Plus, budget routers tend to struggle on the 2.4 GHz frequency, but the RT-AC68P handled it well.